Wow…I’ve neglected my blog for a long time. The recipe that I am going to write about here is another Japanese recipe that I’ve made back in fall (it is winter now :)). Anyways, I found this recipe on a Youtube video here. The video is Japanese and the video quality is not the best but the recipe is AWESOME. 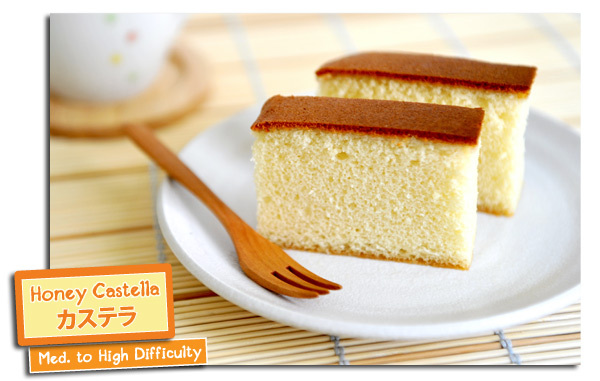 I’ve always wanted to find a good recipe for the Castella or also known as “Kasutera” in Japanese romaji. It is basically a traditional Japanese sponge cake made without using any leavening ingredients (ie. baking powder etc.) nor any oils. It is always served in (almost) square slices like photographed above. Another special thing about this cake is that it is traditionally made with bread flour – not cake flour. The bread flour gives it a slightly chewy texture and honey also adds moisture to the cake which makes it very good to enjoy without serving it with cream, fruits, syrup etc. The castella was brought to Japan by the Portuguese and the Japanese eventually made it to suit their taste, making it a famous Nagasaki sweet. The video above shows you how to bake the cake in a newspaper mould, the instructions for making the mould is here. Yes, it might sound crazy to bake something in newspaper but it works very well according to the video. To my knowledge, this cake is traditionally baked in a special wooden mould but making your own with newspaper is very affordable and easy. I have a 7″ square cake pan at home so I didn’t make my own mould with newspaper, and it just worked as well. I made a half batch of the recipe in the video and baked it in a 7″ square pan. I didn’t follow the instructions on the video exactly. I mixed in the yolks, flour and honey with my trusty stand mixer instead of by hand because I was too lazy to do it by hand. Prepare pan: line insides and bottom of pan with foil and add a piece of parchment paper onto the bottom, sprinkle with turbinado sugar. Preheat oven to about 325 F / 160 C.
Place egg whites in mixing bowl and mix with a mixer on high speed for about 30 seconds and start adding sugar in 2 - 3 times. Beat until firm peaks are formed. Pour batter through a sieve into cake pan, use a spatula or whisk to help the thick batter go through the sieve. Bake in preheated oven for about 60 minutes or until golden brown on top - check with a skewer to see if cake is ready. If ready, take out of oven (with oven mitts) and drop the pan on the counter from about a foot in height to prevent shrinkage. Cool cake. Revert cake onto a piece of parchment paper and plastic wrap, remove foil and wrap in plastic wrap until ready to serve (at least overnight) to preserve moisture in cake (leave upside down). YUM! I love this cake because it is so simple, light and delicious. So moist, delicate and rich in honey and egg flavour – perfect with a cup of Japanese tea! The turbinado sugar is optional but it adds another element of crunchy texture. This cake is best enjoyed the day after so it becomes more moist – kind of like resting a freshly cooked piece of meat. Note: This recipe has very specific instructions, if you followed them closely, it will turn out well! What a yummy preparation! Loved this recipe and the way you write. I am fond of food and I think there is a lot to learn from you! Your photography is praiseworthy too. Do you have a facebook page? Please feel free to follow my blog as well as my FB page (Cosmopolitan Currymania)and I’ll follow your wonderful blog as well!! Thanks for reading my blog and your wonderful comments! I don’t have a Facebook page but I am planning to make one so feel free to follow when I do get one! LOvely Japanese recipe! I am so amazed at how moist and soft the texture of this cake is. And to think the recipe calls for bread flour and not cake flour. I am sure I’ll be smitten by the mild and sweet flavor of honey. Thanks for the post. This is something I will try in my own kitchen. Thanks! This is a pretty delicate cake even though it was made with bread flour. Definitely try it out! This does truly look wonderful. Delectable and tasty! Good job! Thanks for your comments and hope you enjoy reading my blog! Love honey sponge. This looks perfect! Always looking for a challenge–this recipe looks great, not to mention, it’s gorgeous. I’m really intrigued by all the directions. I’ve made regular sponge cake before (probably one of my favorite desserts), and it definitely can be tricky to get it to the right consistency/texture and make sure it doesn’t collapse. Thanks for sharing! Your site is beautiful. You’re welcome! I think this recipe is pretty good so try it sometime! this looks awesome. i remember eating these as a kid when ever id leave the asian market with my grandma. id love to make it,especially for her. but im not sure how to use the Metrics. is there any way you can convert it to the US Measuring? Thanks for reading my blog! This recipe was taken directly from the Japanese video and they are used to doing everything in metrics. There are probably websites that can convert the weight (metrics) of the ingredients to US measurements online. …but could you elaborate on point 10? Are you saying we should flip the pan over and drop the cake from a certain height? I tried your recipe today, the castella has a great taste! However I think I might have missed something in the process (I’m not a beginner but not an expert either! I’m 19 and I bake when I don’t want to write my papers…). First, the parchment paper has stuck to the cake and when I peeled it off, it took a bit of the brown part of the cake (so it won’t look as pretty as in your pictures), and second, I couldn’t pass the batter through the sieve because it was too thick -maybe I should have tried harder? Also, I think my pan was too large since the cake doesn’t look as thick as in the picture. Thanks for your questions! Little things make a difference when it comes to baking, like different ovens, baking times, baking pans, ingredients etc etc. The parchment paper didn’t come off cleanly when I peeled it off so it shouldn’t be a big problem. (Was the cake cool when you peeled it off? or was the bottom browned enough, if not maybe leave it in the oven for a bit longer?) If uneven browning on the top and bottom seem to be a problem – for example, sometimes if it browns too much on the top and not enough on the bottom, I would use a piece of foil with the shiny side on top to prevent the top from burning and continue baking the cake until it is ready. The batter is pretty thick so you will have to use spatula or a whisk to work it through – but my sieve wasn’t a fine one, if you used a very fine sieve that might be the problem. PS: Can I ask what kind of baking pan you are using – size and material? I made the castella cake yesterday. It was hard to wait until today to eat it. It was spongy and very yummy! Thanks so much for sharing the instructions. You’re welcome, glad to hear that the recipe was a success for you! Thanks again for posting and for sharing! I’ve never eaten this cake, and I’ve never really liked sponge cakes. But I baked this one and it was a HIT !! Thanks, Winnie. Glad the recipe worked so well for you. Can i use normal plain flour for this? Your steps and photos are very detailed and I’ve followed them but my cake still failed, it sinks in the middle when I removed from the oven. What could have went wrong? – Not incorporating enough air into the eggs and sugar – mixture hasn’t reached the “ribbon” stage. – Over-mixing the batter after adding bread flour – the batter should just be mixed until incorporated to prevent too much deflation. – Cake wasn’t cooked thoroughly in the middle – best to test before taking out of the oven. – Did you drop the cake pan on the counter after taking it out of the oven (as written in recipe)? It prevents shrinking and sinking. I haven’t see the outcome of your cake or the process of how you made it, so this is just my basic diagnosis, hope it helps! I am not sure if you have seen the video linked in the post – it might help you because it shows you step-by-step stages of the batter. Thanks for your reply I will definitely try it again and take note all the points you mentioned. Pingback: ???? ??? ????? » ???? ???? - ????? ?? ???? ?